One of the most extreme forms of dry fasting concerns the practice of the so-called Marathon Monks (gyoja) of Mt. Hiei, Japan. According to tradition, aspiring Zen Buddhist monks can volunteer to undertake a seven-year challenge which involves completing 1000 marathon and double-marathon runs alone on the sacred mountains surrounding the city of Kyoto. As if this weren’t hard enough in itself, they also survive on a minimum of both sleep and calories. Through the rigours of their training and the thousands of hours spent running in solitude along forest paths, the Marathon Monks hope to find enlightenment. In typical Japanese fashion, failure is not an option. Each monk carries a symbolic rope and dagger with him at all times. If, for any reason, he is unable to complete one of his runs, suicide by either hanging or disembowelment is the only honourable option. Each year, training takes place in a 100- or 200-day season in which the monk must complete a rugged course varying between 30km and 84km. There are no rest days and no excuses for not finishing. The only consolation physically is that speed isn’t an issue. The goal isn’t to reach to the “finish line” (that is, the monastery from where he started) as soon as possible. Rather, each day is a pilgrimage, and finishing the daily course too soon is actually seen as a sign that the monk hasn’t spent enough time contemplating his prayers while running and during the brief stops at various shrines along the way. As if the relentless running weren’t superhuman in itself, the greatest challenge of the dyoja embodies an entirely different practice. This takes place at the end of the fifth year of training, when the monk replaces movement with stillness, extreme yang with extreme yin, and he undertakes doiri: a nine-day dry fast, the intent of which is to bring the monk close enough to the threshold of death that he gains insight on life. This is more than just ‘any’ nine-day dry fast. Stillness here embraces every sense of the word. Of course, this includes no food or water, which be expected of any dry fast. But true stillness here also means no movement and – in order for it take place fully consciously – no sleep for the duration of the fast. Instead, the monk sits motionlessly in continuous prayer with two assistants present at all times, in order to prevent him from nodding off. The only break to this continuum is a brief daily walk to a nearby well in order to fetch water – not for himself, but instead to provide an offering to Fudo Myo-o, the ninth-century Buddhist priest who founded the monastery on Mt. Hiei. 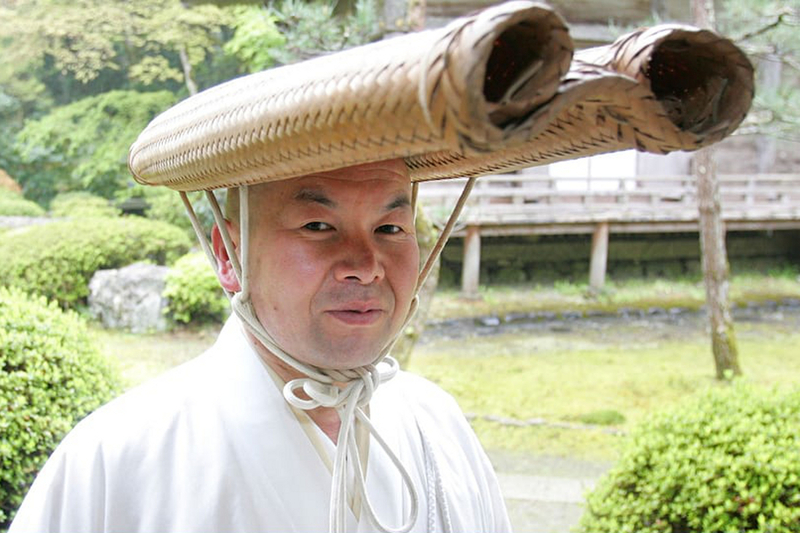 In order to prepare for doiri, the gyoja (marathon monk) tapers down his intake of food and water to prepare for the fast, usually limiting himself to one simple meal of noodles, potatoes and soup during this time… The first day is no problem, but there is some nausea the second and third day. By the fourth day the pangs of hunger usually cease. By day five, however, the gyoja is so dehydrated that the saliva in his mouth is dried up and he begins to taste blood… Defecation usually disappears from the third or fourth day, but very weak urination generally continues right to the end. The 2.00 am water-taking ritual helps revive the gyoja. As he steps out of the hall made stuffy by incense smoke and poor circulation, the pure, bracing mountain air helps clear his head. Gyoja claim further that they absorb moisture from the rain and dew through their skin during this walk outdoors. The round trip to the well takes fifteen minutes the first day, but near the end it requires an hour, as the gyoja seems to move in a state of suspended animation. After finishing doiri and regaining his strength again, the monk resumes training a few weeks later, transformed, reinvigorated. From this point on, every step of his daily marathon becomes an expression of life. Considering the rigours of their spiritual path, it’s no wonder that over the centuries the marathon monks have been considered as ‘living buddhas’. In days of old, they also enjoyed the unique privilege of being allowed to appear before the emperor without wearing shoes: a crime for which anyone else would have met certain death! More important than the external recognition, though, is the internal transformation – both physical and spiritual – which inevitably takes place. Having completed their seven-year challenge, having experienced the purification of both the running and the fasting, many of the monks continue on their own initiative, training and fasting well into old age. Through their example, the marathon monks offer inspiration to the rest of us. Even if we manage only a mile or two each day, even if we fast just a little bit, it can only do us good! Hi Tallis my 72 hour dry fast has begun. 72 hour dry fast. When i complete my fast i will let you know how it went and how my refeeding went as well. Tallis i want to do another 72 hour dry fast this coming weekend, i want do as many as i can till its just natural to my body . Do you think thats pushing it to much ? Well thank you for your comments and advice. It’s a good idea to aim your fasts for weekends if you can’t take time off work. Otherwise, as far as your question goes, there’s no fixed answer. Instead, you should listen to your body! Is it truly your body which needs to fast this much, or is it your mind which is driving you forward? Don’t take it personally, but when someone has so much enthusiasm and emotion invested in fasting, it often comes attached with the danger of becoming addicted to fasting. Yes, it’s possible to become addicted to fasting, just like cigarettes or alcohol. Personally, I think the idea of a 3-day dry fast every week is pushing it over the long term. But your body should tell you if you actually are – so long as your mind is willing to listen to what it’s saying. And that is the key point here! ( SLOW AND SOFT WINS THE HYDRATION AND REFEED RACE ) IN A DRY FAST ! THANK YOU TALLIS. Congratulations on finishing your fast Franco! Just a word of advice for next time… After drinking plain water, it would be better to involve citrus next rather than yogurt: either squeezing lemon into water or by slowly eating an orange. The citrus is both easily absorbed as well as helping to detox and stimulate the liver so that it’s ready to continue it’s job in digestion. As a dairy product, yogurt will slow down the absorption of water in the intestines – and after a 3-day dry fast this is definitely your priority! Think of it like this: if you make rice pudding (made by boiling rice, water and milk), you always boil the rice first with the plain water and add the milk only afterwards. If you add the milk from the start, the rice can’t fully absorb the water and it stays crunchy! Thank you i will remember that for the next time great advice. If dry fasts feel right for you, then you should just go with this! I also know that longer water fasts are difficult for you to fit into your life, so maybe shorter and more frequent dry fasts will be the best solution for you over the long term. My advice to you would be to VERY carefully and gradually increase the duration of your dry fasts (by a maximum of 12 hours each time) until you reach about 72 hours. Stay with this length until it feels EASY. Then, rather than aiming for even longer fasts, I would increase their FREQUENCY – but only to the point that it feels COMFORTABLE and not a physical or psychological strain. This will be a powerful and yet sustainable method to cleanse. If you do find that you occasionally have longer periods of free time for longer dry fasts, then you could try a 4-day dry fast during some time off work. If that feels manageable, then you could try a 4.5 day dry fast the next time you’re on holiday. But I’d highly recommend that you don’t work during any dry fast longer than 3 days! I’m glad to have been able to help :-).